Some of you might be looking at that title and thinking that there must be a lot more going on in this comic, that maybe it holds some of the secrets of the universe or that the stoner alien is a jumping off point for a prolonged ethical discussion about stoners and/or aliens. Nope. 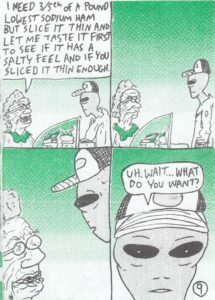 Sometimes a stoner alien is just a stoner alien. But it’s still Pat, so there are plenty of funny bits involved. 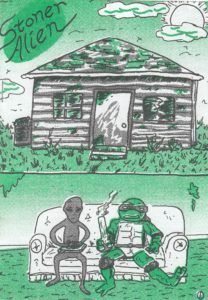 The story, as you may have guessed, deals with the stoner alien and his friend, who happens to be a teenage mutant ninja turtle. Were they aliens? Seems like they were just regular earth turtles who got hit by some radioactive goo. Anyway! Our heroes have a brief discussion about comics (Stan Lee vs. Steve Ditko specifically), demonstrate some advanced techniques for breathing in/out while smoking pot, and head off to their job at a deli counter. As you may have guessed, our alien friend has all sorts of problems paying attention to people when they’re asking for help, which leads to hilarity that lasts all the way through the point where we see how helpful a sneeze guard can really be. So yes, it’s true that this probably isn’t the comic you’re looking for if you’re on a nonstop crusade for enlightenment and the greater truth behind it all. On the other hand, if you’d like to get a few chuckles out of the behavior patterns of stoners (or if perhaps you are a stoner who is curious about these new smoking techniques I’ve mentioned), then step right up and send the man some money! I’m not sure how much money because it’s not on his website at the moment, but maybe $5? Posted on November 27, 2018, in Reviews and tagged Pat Aulisio, Stoner Alien. Bookmark the permalink. Leave a Comment.